Introducing the Leaf AI Robot. Have you ever wanted to create artificial intelligence software (AI) but did not know where to start? Have you wanted to put this artificial intelligence into a robot? If so the Leaf AI robot is the robot that you have been looking for. Leaf is the AI software that starts you with a working AI framework that you can add to and customize as you wish. This framework is an exciting first step to having your own Leaf Robot! Leaf was put together by the Leaf Project, a group robot development program, started by members of the Robotics Society of Southern California, whose objective is to develop a robot platform that supports experiments with artificial intelligence, vision, voice recognition, navigation, etc. Leaf builders span the entire planet! Leaf was created by three folks beginning in 2003. 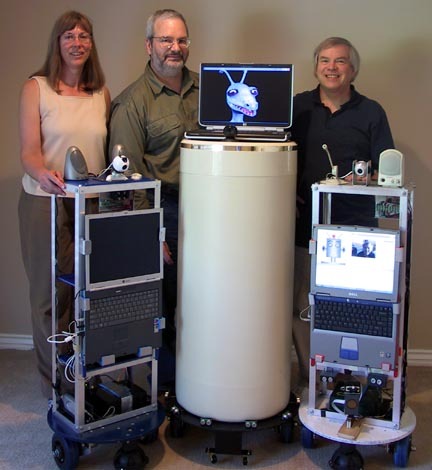 Bruce Weimer, Alex Brown and Robin Hewitt were three very dedicated people who brought the first Leaf robot to life. Leaf’s software is considered an artificial life program, inspired by Steve Grand's computer game Creatures, in which artificial beings hatch, develop, and interact in a simulated environment. A PC (software-only) version of Leaf was demonstrated in 2003, construction of the first robot began in early 2004. Leaf has an artificial personality. He can feel happy, sad, bored and more. Leaf is an open source project. Leaf responds to spoken commands. Leaf responds to visual information. Leaf can be used with just a PC. Leaf software can be interfaced to a Leaf robot through an open source circuit board. Leaf is programmed in LISP. Leaf can use a CSLU Toolkit animated face. Leaf can be used with RoboRealm. Leaf uses Robin Hewitt's webcam implementation for vision. Leaf software is currently used in an R2-D2 replica. Leaf has a hardware/ electronic platform created by Alex Brown that supports basic mobility, sensing and control from an on-board PC. Leaf was used in a Lost in Space (model B-9) robot replica. Leaf is used in the actroid Robot Betty9. In 2012, A fork of the Leaf code now includes ROS stacks for navigation utilizing a LINUX machine in tandem with a Windows PC. Where will Leaf go next? Only the programmers and robot builders in the Leaf group know for sure.